There's nothing like snuggling with your grandchildren early in the morning..!! Lexie spent the night with us and to hear her sweet little voice in the morning and get all kinds of hugs and kisses from her is the BEST of the BEST! She and Grandpa are eating cheerios and watching cartoons at the moment so I thought I would sneak in here and blog to you! I was wandering around on Pinterest this morning and found some beautiful quilts that I thought I would show you! 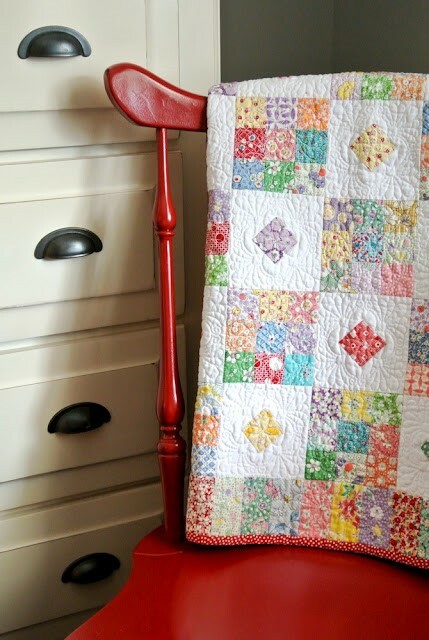 This first quilt is so sweet... I just love the pink and brown tones... and then to occasionally add a bit of yellow... it's just perfect! 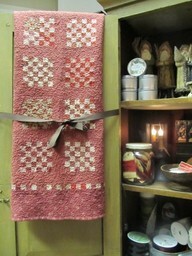 I can just see this all quilted and washed...smelling so good... cuddling up on the couch... reading a book or knitting! YUMALICIOUS!! Then... 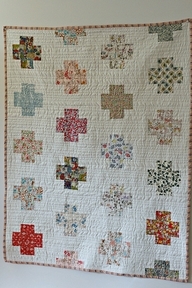 I'm simply a sucker for patchwork quilts... this one... 36 patch blocks. It's so simple but so wonderful at the same time. Now.. if this were in all different blues... va-va-voom! In case you didn't know it... 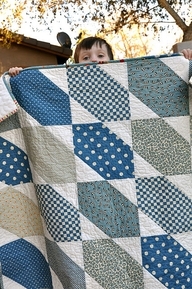 I'm IN LOVE with blue and white quilts. Speaking of blue and white...here we are!! LOVE...LOVE...LOVE this quilt! Of course...why not... it's blue and white! HA!! Then... there are those quilts FULL of Aunt Gracie fabric. Mix the pretty colors with a CRISP WHITE MUSLIN... and it just doesn't get any sweeter! 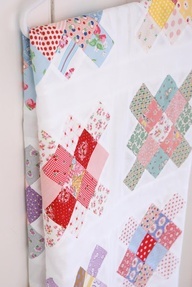 I don't think I've EVER seen a quilt with Aunt Gracie fabric in it that I haven't LOVED!! Oh... and then...we have this sweet, sweet Grandmother's Flower Garden. 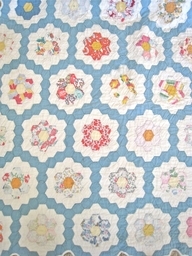 This one I'm especially in love with because of the soft blue she has selected to set the blocks in. It's just perfect. Then she used the different yellow tones for her flower centers to give it that little pop of color. Gorgeous! 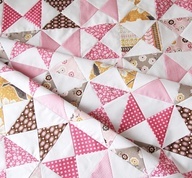 And... yet here is another sweet quilt with somewhat brighter shades of pastel colors. I love this one TOO!!!!! Then... how much simpler can this be? However... it's just the perfect reproduction quilt that I love. What a fun one to make... especially when you get to pick your MOST FAVORITE - OF ALL TIMES - reproduction prints and set them in a soft muslin... or even a tiny shirting fabric. I think I especially love the NO BORDER look... it makes it look older and more on the antique looking side! Then... for something completely different...a quilt by Yoko !!! 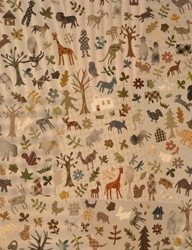 I just love this quilt... it hits the primitive side of my loves! This photo may not be too good...but can you just see all of the different animals and leaves? All hand appliqued! LOVE IT! What a fun time it would be to see it in person and count all the different things on it. I especially love the giraffe and what appears to be a running fox? Ok...that was my "quilt journey" today... now here's a few other things I found!! These are things that I think I would love to HAVE!! First of all... is this body on this chick!! BUT... I would also love to be able to make this pretty dress and wear it as sweet as she does! Isn't it cute? Then... I don't know about you... but I hate the cabinets under my sink! I hate crawling under there to find things... I hate the look of all the junk under there... I think this is a MUCH BETTER solution! Don't you? 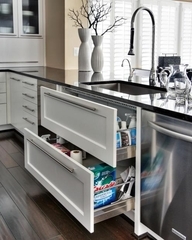 Wow... the top drawer can be for the things you use all the time and the bottom drawer can be for those things that you need in your house...just don't need toooooo often! Let's all change our kitchens...what do you say? Of course...this probably costs as much as buying a new car... but ... oh well...what the heck! Right? Then... 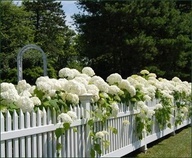 I want a yard with a picket fence with all of these hydrangeas growing on them. So... then I can cut some of them...let them dry and use them in my house. I love these silly flowers...they are so feminine to me... don't you think? However, with my "black" thumb... I don't really see these in my near future...guess I will just admire the photos of them. Have a super day... and get something DONE!